U.S.-Mexico border delegation hears from immigrant women stuck in Nogales, tours border wall and Sonoran Desert | Fight Back! 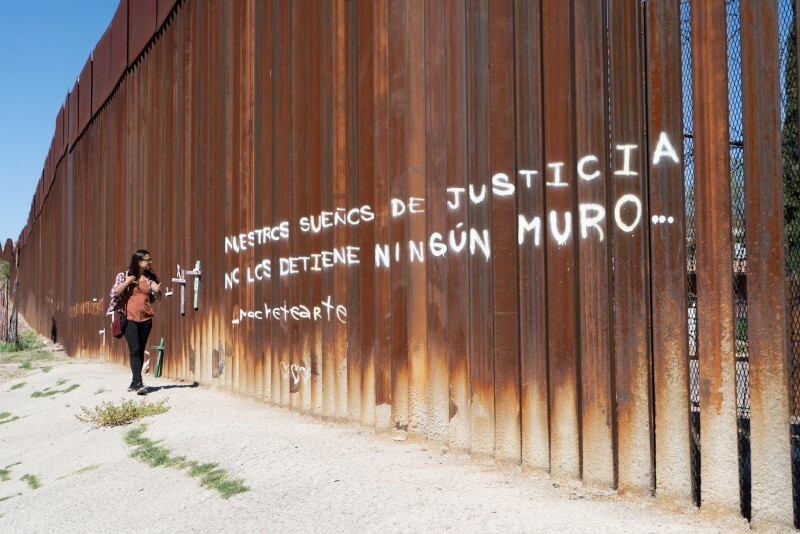 Nogales, Sonora, Mexico - The second day of the Legalization for All Network delegation to the U.S.-Mexico border on March 31 was intense and emotional. The delegation divided into three groups for the day, which allowed them to gain a wider range of experiences. One group of delegation members crossed the U.S.-Mexico border into Nogales to visit the organization HEPAC (Hogar de Esperanza y Paz - Home of Hope and Peace) and hear testimonies from women fleeing horrific situations and trying to seek asylum in the U.S. Another group accompanied the humanitarian organization Tucson Samaritans deep into the Arizona desert to leave water for immigrants walking through remote areas and to see the border wall. And another volunteered with the Inn Project, an organization in Tucson that provides support and shelter for immigrants released by ICE in Tucson. The guide for the group crossing the border in Nogales was a member of the indigenous Tohono O'odham Nation, whose land is on both sides of the U.S.-Mexico border and who have been harshly impacted with flagrant violations of their sovereignty by increasingly imposing border militarization. The delegation learned about the O’odham people’s struggles for sovereignty and how that is inseparable from the struggle for immigrant rights and against border militarization. The group that crossed into Mexico went through the border crossing in Nogales, which divides Nogales, Arizona from Nogales, Mexico. Until relatively recently, this border was much more fluid, with people crossing back and forth regularly and the two cities bearing the same name more united. Now a massive inhumane wall, which the Trump administration recently garnished with razor wire on the U.S. side, cuts the two Nogales in half. Before crossing the border, the delegation first walked along the U.S. side of the border wall. On the U.S. side of the border, the wall is sterile and imposing. When President Trump ordered the National Guard to the border in 2018, they added coils of razor wire all along the U.S. side of the wall. Border Patrol trucks are ever-present, driving around and parked near the wall, always watching. There are towers above watching with technology. The imposition of a wall in the middle of the two cities makes a deep impression. After walking along the U.S. side of the wall, the group drove through the Nogales border crossing into Mexico. When entering Mexico there was no wait or hassle. Once across, the group walked along the Mexico side of the wall. The difference was stark. While the U.S. side was sterile and threatening, the Mexican side had a feel of defiance. 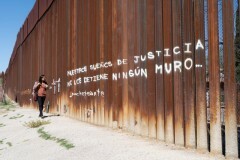 From graffiti saying things like “paz,”“chinga la migra!” and “Palestina Libre, boicot Israel” to murals painted on the wall slats, to an art installation and memorials for Jose Antonio Elena Rodriguez - a young person shot to death by U.S. Border Patrol agents on the Mexico side of the wall - there was vibrance, spirit, resistance and life. And no razor wire. After seeing the wall, the group went to visit HEPAC, an organization based in a Nogales neighborhood that does humanitarian work there and also helps people who are stuck in Nogales hoping to get to the U.S. to apply for asylum. HEPAC’s mission is “to create a healthy community in Nogales, Mexico where citizens do not feel that their only choice for survival is to risk their lives in the desert in an attempt to immigrate to the United States.” They are a nearly-all volunteer operation that provides daily meals and a playground for neighborhood kids, as well as youth and adult education classes, a community garden, a water purification system, and a women’s cooperative. In addition to these things, they provide shelter for women and children who are attempting to enter the U.S. to ask for asylum, but who are blocked by the Trump administration’s policy in violation of international law, which is blocking people in Mexico for long periods rather than allowing them to request asylum right away. At HEPAC, the delegation met with about a dozen women and their children hoping to request asylum in the U.S. One after another, they told us their harrowing stories of what they’re fleeing in their homes in Honduras, El Salvador, Guatemala and southern Mexico. Nearly all told of children or other family members murdered by street gangs or cartels, threats or experiences of sexual abuse, or receiving death threats themselves before deciding to run for their lives with nothing but the clothes on their backs. They also spoke of a culture of impunity where they knew reporting their situation to the government or police would either be useless or potentially crease more problems for them, since the police and government themselves are penetrated by organized crime. Hearing their stories one after another was like a repeated punch to the gut, every word piercing through Trump’s lies and mischaracterization of immigrants as a criminal threat rather than what they are - people fleeing from the poverty, violence and organized crime that has taken over their countries due to decades of U.S. government economic and military policies. The strength of these women who are fighting for their futures and their children’s futures despite the horrors and threats both behind them and in front of them was incredibly inspiring. One woman from Honduras had traveled north with the Honduran caravan in January. After giving her emotional testimony, when asked about songs sung on the caravan, she smiled and started singing the song they sang as they walked their way through Honduras, Guatemala and Mexico - a song of strength and defiance that was punctuated with a chorus of “Fuera Joh!” This is a reference to corrupt U.S.-backed Honduran President Juan Orlando Hernández (“JOH”) who is widely blamed for a culture of impunity and doing nothing to improve the unbearable situation that forces mass migration from the country. The whole room lit up and clapped along as she sang the caravan’s song of hope and defiance. When the delegation attempted to reenter the U.S., the experience was very different than entering into Mexico. The line was hours long, and when arriving at the border, Border Patrol officers took everyone’s passports, then came back and ordered everyone out of the vehicle while being instructed to leave all cell phones in the van. Everyone was then led into a small locked jail-like waiting room with no bathrooms. Border Patrol did not explain why this was happening or how long it would go on. After a relatively short time everyone was released, but with no explanation about why they were singled out for a vehicle search. The group that did not cross the border and accompanied the Tucson Samaritans into the desert also had an intense day. They started early in the morning on a day-long ‘border orientation’. This included seeing the border wall from the U.S. side, where a Tucson Samaritans member showed them the various phases of the border wall that were built in waves from the 1980s to the present. With each addition to the wall, immigrants seeking to cross the border are driven further into the unforgiving desert, increasing injuries, trauma and deaths. The group also learned how Tucson Samaritans tracks the ever-changing immigrant trails through the desert to determine where to leave water so that immigrants don’t die from dehydration. In the course of their humanitarian work it is not uncommon for them to find remains of people who died trying to cross the border. The group encountered a memorial marking the spot where a immigrant had died. The group accompanying the Tucson Samaritans had to pass through Border Patrol checkpoints well within the borders of the United States, where they were asked about their immigration status. This is the reality that people who live in southern Arizona face daily - living in a militarized zone where they have to cross through checkpoints, there are constant surveillance towers, drones and helicopters circling overhead, and where Border Patrol trucks are ever-present. The desert border orientation made clear that the effects of border militarization are not just felt in Mexico, but inside the United States as well, with immigrants dying in the unforgiving desert and whole communities living under what amounts to military occupation. Another delegation member spent the day in Tucson with The Inn Project, a church-based project where immigrants with children come for food, rest and other relief after being processed by ICE and approved to pursue asylum. When someone in ICE custody is approved to pursue an asylum claim, ICE simply releases that person on the streets of Tucson without any way to get in touch with anyone or get to where they need to go. This is where the Inn Project steps in, taking immigrants in and giving them support until they are able to make arrangements for a place to stay and how they will get there. This is often in another city or state. The work of The Inn Project reflects the chaotic reality of ICE detention and U.S. immigration policy overall - even immigrants who are approved to seek an asylum claim are simply left to their own devices, leaving humanitarians and activists to deal with constant urgency and crises as ICE releases people. Like most of the efforts supporting immigrants, the Inn Project is held together by volunteers and they are always in need of help. The second day of the Legalization for All border delegation was extremely impactful and exposed the raw reality of the injustice of U.S. immigration policy. This was true seeing the destructive reality of the border wall and border militarization on border communities. It was true in Nogales, Mexico, speaking with women and children being delayed or blocked from even requesting asylum in the U.S. It was true in the unforgiving Sonoran Desert in Arizona, where immigrants are forced to cross and risk death in the desert due to increased border walls and militarization in more urban areas. And it was true in Tucson, where immigrants who are allowed to pursue an asylum claim are simply dumped on the street by ICE. The second day of the delegation made an emotional impact and exposed the depth of the injustice in immigration policy. But all was not depressing. Delegation participants were also deeply inspired by the grassroots organizations doing everything they can with few resources in the face of these towering injustices to respond to this human rights catastrophe and stand up for basic human dignity and justice for people forced by circumstances to leave their countries.